Recent work at the University of Minnesota, the National Institute of Standards and Technology, and Argonne National Lab has combined X-ray and neutron scattering to probe elusive operating mechanisms in a new class of devices known as electrolyte transistors. 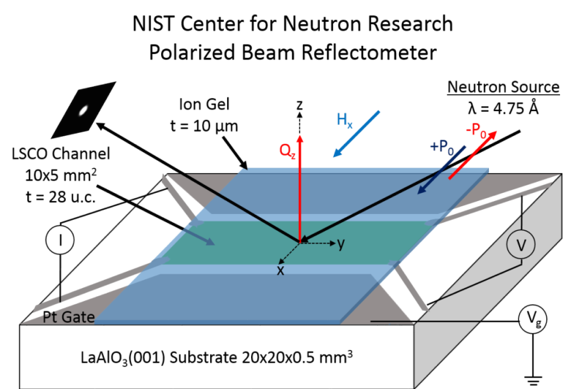 Electrolyte transistors essentially combine electrolytes, such as organic ionic liquids, with novel materials such as inorganic complex oxides, to enable control of materials properties (e.g., magnetism) using only an applied voltage. This functionality could provide revolutionary breakthroughs in devices such as hard disk drives. One of the major challenges in understanding their operating mechanisms, however, is characterizing the devices “in operando”, i.e., as they are actually functioning. In this work, the research team made a breakthrough by establishing not one, but two means to achieve in operando characterization of electrolyte-gated magnetic oxides. Devices were specially designed to enable high energy X-ray diffraction and polarized neutron reflectometry measurements, providing both structural and magnetic information. The devices were found to operate completely differently for different signs of the applied voltage, a major advance in terms of resolving the debate surrounding their operating mechanisms. The work was funded by the National Science Foundation MRSEC, and the Department of Energy Center for Quantum Materials at the University of Minnesota.